For #SundaySupper this week, we are celebrating Labor Day Cookouts! I knew I wanted to share something sweet, so I immediately started thinking of easy desserts. 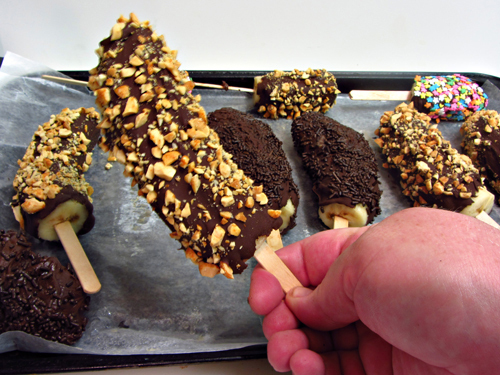 Well, you can’t get much easier than this: frozen chocolate bananas. Our family is fairly new to frozen bananas — I made them for the first time a few months ago and now it’s a big time favorite in our house. To start, line a baking sheet or freezer-safe plate with wax paper. Peel your bananas and cut them in half. In the cut end, insert a wooden popsicle stick. Place in your freezer until frozen. 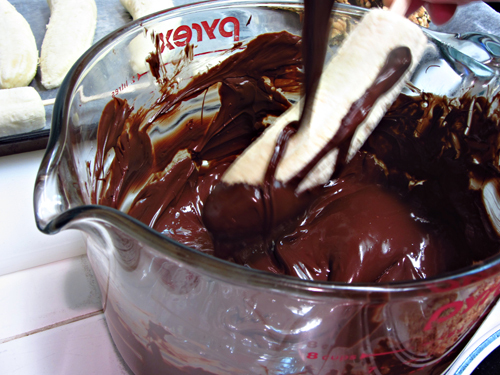 Melt chocolate and dip and/or spoon the chocolate over the frozen bananas. Um, please excuse this blurry photo….but you get the idea. If you wish (and why wouldn’t you?? 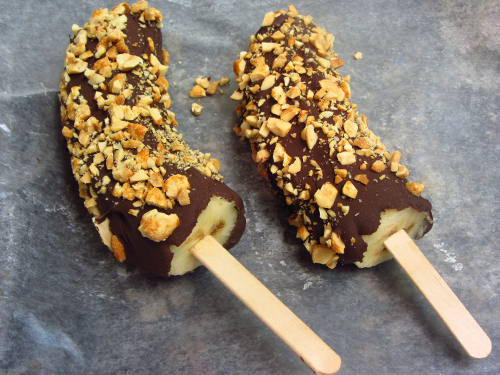 ), you can take the chocolate dipped banana and make them extra special with sprinkles or chopped nuts. You have to work quickly after you dip in chocolate, so right after it’s covered, spoon your sprinkles or nuts over the chocolate banana. 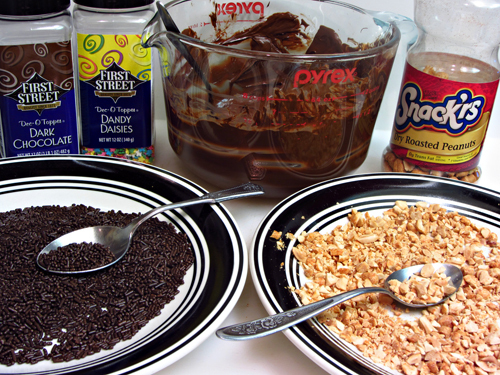 As you finish with the sprinkles and nuts, lay them back onto your wax paper covered baking sheet or freezer-safe plate. Place back in the freezer so the banana can stay frozen and until the chocolate has completely set. When time is short, easy desserts are the way to go. 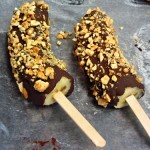 Here’s how to make easy & frugal frozen chocolate bananas, with chopped nuts and candy sprinkles. Line a baking sheet or large freezer-safe plate with waxed paper. Peel each banana and cut each one in half. Insert a stick into the cut end of each banana. 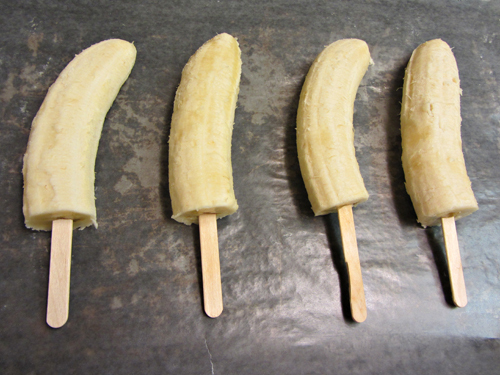 Place bananas on wax paper and freeze until frozen. In a glass, microwave-safe bowl, add chocolate chips and oil. Place in microwave and microwave for 10-15 seconds on high power. Remove bowl from microwave, stir completely. Return to microwave to repeat steps until chocolate is almost completely melted, but a few chips remain. Stir until those chips are completely melted. Place decorations on plates. Remove bananas from the freezer. Take one banana and dip in chocolate (or spoon chocolate over, if you prefer). Working quickly, immediately dip the chocolate covered banana in the decorations. Return decorated chocolate banana to wax-covered baking sheet or plate and return to freezer until banana is completely frozen and chocolate has hardened. –Microwaves vary greatly, so exact heat settings and times cannot be given for melting chocolate. Refer to your owners manual for recommendations. –While my chocolate vs banana ratio worked for me, your results may vary if your bananas are larger or smaller, or if your chocolate coating is thicker or thinner. I find this recipe works for 3-4 bananas, but you may have leftover chocolate. –If using large bananas, it may be necessary to cut a 2″ (or so) size section from the middle of the banana, otherwise the bananas become too top-heavy. 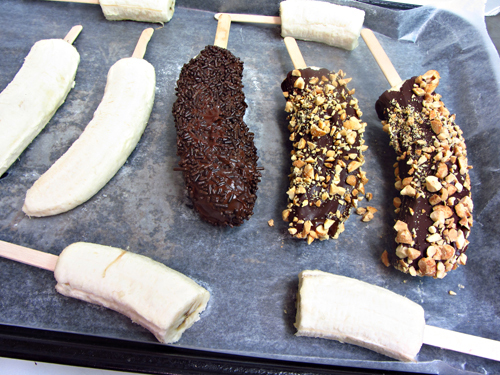 These small pieces can be made into a mini frozen chocolate banana, the same way as the larger ones are made. You’ll see in one or two of my photos where I have a couple small bananas. –You might find it helpful to remove the finished frozen chocolate bananas from the freezer, and place them in the refrigerator, about 15-30 minutes before serving. Here are the rest of the Labor Day Cookout Recipes for #SundaySupper — I hope you’ll check them out too! My kids love making these! So much fun! Thanks Jamie! The mashing up the cheesecake part would be particularly fun and easy for little ones. And you can’t go wrong with dipping something in chopped up candy bars! You just reminded me that I really do need these in my life. They look absolutely delicious, and I love that they’re an easy snack. Thank you, Jennie! You should definitely try making them sometime. I love this! I’ve seen these at the grocery store, but I bet homemade is better! Going to try this recipe this week for the kids! Thanks! 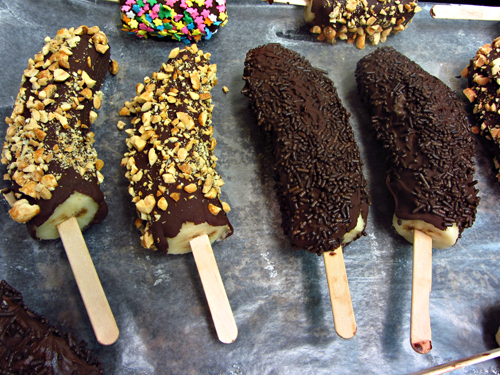 I fell in love with frozen bananas after having them at Disney as a teen. Haven’t tried them with my preschooler yet, will have to see if he goes for one covered in chocolate and sprinkles! This is awesome!!!! Looks so delicious and healthy too. Nice idea. I just recently made frozen bananas too but I made them into bite size banana split sundaes. Love the idea of putting it on a stick. Makes it easier and fun too eat. They look delicous! I can’t wait until my daughter is old enough to make things like this with me. It looks like such a fun kid activity. Easy indeed! I almost never run out of bananas. It would be a great way to use them up and be just the perfect weekend treat. I always have ripe bananas around the house so this is absolutely perfect for me! Plus who doesn’t like chocolate?! 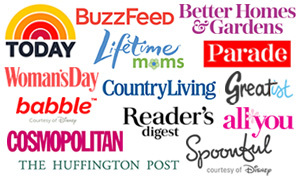 Brandie, You make this look so quick and easy. This is a MUST Make !!! I always love redaing your posts!!! these are great! both my little guy and i would just love these! Yum!! Perfect for kids at a party. And you could put just about anything for the sprinkles – great treat! These look so good. What a fun idea. My kids will love them. You can´t go wrong with this dessert, gorgeous and yummy! Perfect for a cookout! I need to make some room in my freezer to make some of these! They look so delicious! Love frozen bananas! Totally yummy idea. Love it!!! Simple and delicious- and kids love them! thanks! I made these for a friend’s bday in August, and they were a HUGE hit. Who knew? I think they took all of 5 minutes to assemble! I have always wanted to try these, even though I’m not a banana fan. Maybe I can make them for my hubby and live vicariously through him. These are so fun and amazing! We love getting these at amusement parks! I can’t wait to make them at home! Can’t beat frozen fruit in the summer, Brandie! What a lovely simple dessert that’s sure to be a winner with the kids. Simple, easy, & tasty dessert. Great for cooling down after being over the hot grill on Labor Day. Just like what you find at the amusement parks – yum! Perfect way to end a holiday cookout! These look delicious, Brandie! Happy #SundaySupper!